Today we have an interview with Susanna Calkins, author of A Murder at Rosamund's Gate, a mystery novel about a seventeenth century chambermaid who is accused of murder. I asked Susanna questions about how she did her research. Not only did I learn about her research, I also learned about seventeenth century murder ballads...read on. 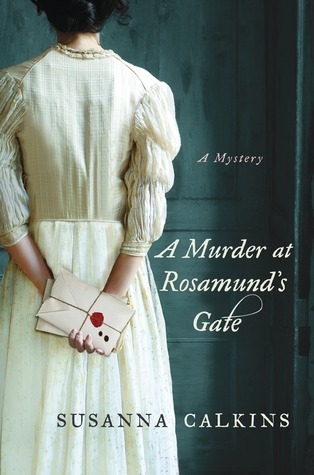 A Murder at Rosamund's Gate is set in seventeenth century England. How did you do your research and what was your favorite part about doing the research? Great question! I started doing research in this time period (the 1660s) when I was a graduate student in history at Purdue University. I was fascinated by this time period—the mad gaity that accompanied the return of King Charles II (and the end of the dour Puritan rule), the plague, the great Fire of London, as well as the great religious tensions between the established Anglican church and all the dissenting religious groups (such as the Ranters and Quakers). I loved learning all about it! I had the opportunity to work in London (serving aboard the Golden Hinde, a 16th century museum ship dry-docked in the Thames), in Southwark, which helped me get a feel for the city. And once I started delving into how mid-seventeenth communities dealt with murder and violent crime, it raised a lot of questions for me that I really wanted to answer. How did your research help you develop your protagonist, Lucy Campion? As a social-cultural and gender historian, I’ve always been interested in how ordinary people lived their lives. In particular, I had several questions that informed the creation of Lucy: Who would really care if a female servant were murdered? Who would do everything she could to bring that murderer to justice, even after the authorities had given up? And, what kind of resources would have been available to an uneducated servant to discover the identity of a murderer? In Lucy, I wanted to create a strong female character who would question the world around her, without giving her an overly modern mindset. Was there a story you encountered in your research that you didn't include in the book? Yes! In my research I came across a funny story told by the famous diarist, Samuel Pepys. Apparently, on Valentine’s Day, there was a tradition that a man had to give a gift to the first woman he saw that morning, regardless whether that woman was his wife, mistress or servant. In Pepys’ rather dissolute household, a number of women would vie to be the first he’d see—a fact he seemed to quite enjoy. Originally I included my own version of this story in ROSAMUND, but unfortunately it did not make the final cut. Are there any photos you can share from your research? The images I’ve included are examples of the murder ballads that the public would buy for a few pennies and pass around to their families and neighbors. They’d even paste them on the walls, as a form of decoration. 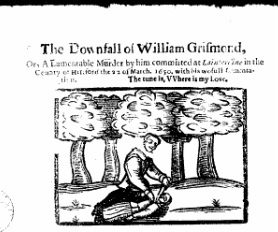 Citation for attached ballads: The downfall of William Grismond: or, A lamentable murder by him committed at Lainterdine in the county of Hereford, the 22 of March, 1650, with his woful [sic] lamentation. It's very interesting to read about author's research. They're very dedicated. Thanks! I enjoy the research but try not to be too heavy-handed in my novel. Fascinating! This book is next on my to-read list. Thanks Velma! I appreciate ti!